Purim is a Jewish holiday in late winter/early spring. It celebrates saving the Jewish people from Haman who was planning to kill all of the Jews in his country, the ancient Achaemenid Persian Empire. It is a time to dress up in costumes, to read the Scroll of Esther and to share a special meal with family and friends. It is also a time to give to those less fortunate. A special treat for Purim is hamantashen, a triangular jam or fruit filled cookie. Like other Jewish festivities, this a special event with special foods, symbols and good family fun. Learning about Purim by coloring images of Purim and tracing words associated with these images is a good activity for young people. Ronit Gizel Shaltiel has created a wonderful coloring book for Hanukkah. 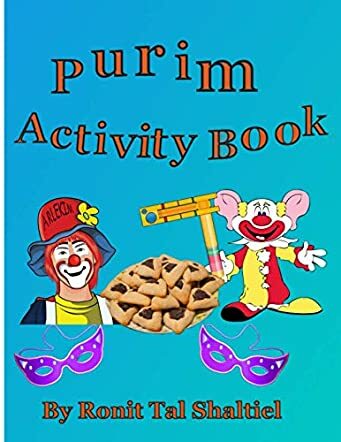 Purim Activity Book is a super activity book full of lots of things to do to entertain young minds while they celebrate and learn about this very special time in the Jewish calendar. Each page has another image to color and complete with its word, which the young reader will learn how to read and write. There are also activities like mazes and hidden word games as well as a treasured recipe for hamantashen, complete with a concise list of ingredients and detailed instructions. Young people like to keep active while they learn and this is the perfect learning tool to accompany the excitement of Purim in an educational exercise.